A family move often leaves children feeling sad or worried about what changes the move will bring. A farewell party for the child and her friends gives her a way to find some closure as well as spend time with everyone before she leaves. Your child's feelings toward the move and her age play a role in the planning process for a going-away party. Schedule the goodbye party as soon as possible once you know about the move. Hosting the party too close to the move makes the party stressful because you are also trying to complete tasks related to the move. A last-minute party is particularly difficult if most of the house is packed, especially if you plan to host the party at your home. An alternative is to rent a hall or hold the party at your church. A themed going-away party adds to the excitement and helps determine party details. One option is to use your new location as a theme, especially if it is very different from your current location. If you move from the Midwest to a desert location, for example, decorate the party with cacti, sand and other desert-themed decorations. This builds excitement for your child and helps the other kids understand where you are going. A walk down Memory Lane is another theme option. Use the party as a means to relive moments with the guests. Videos and photos of both the guests and previously attended events work well for this theme option. Play your child's favorite games and schedule activities he enjoys doing at the goodbye party. This gives him one last chance to do these activities with his friends before the move. If your child is particularly artsy, a scrapbooking session is one entertainment option. Ask the kids to decorate pages of a scrapbook for your child to keep. Provide cards for each of the guests to write a special message in. 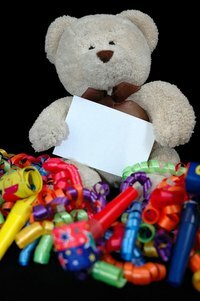 Keepsakes from the party help the kids hold onto the friendships they developed. A guest book or scrapbook page signed by each of the guests provides a keepsake for the child who is moving. Similarly, autograph books for everyone at the party are fitting party favors. A special gift picked out by the child who is moving provides the friends she leaves behind with a reminder of the friendship. A group photo from the party along with a picture frame also works well as a party favor and keepsake.